Thanks again to Tom Harrison, 1965 Kansas City Athletics pitcher, who shared a bonus story when I wrote to him. “One quick story about Moe Drabowsky. After spring training, the whole team had to fly to KC and have our cars driven to KC by paid drivers. From the KC airport, four of us shared a cab to downtown KC hotel, where we had to stay until we found an apartment. On that ride were Joe Rudi, Catfish Hunter, Moe Drabowsky and myself. Joe sat up front. Just before we got to the hotel, Moe leaned over the front seat, pulled out a little bottle of sulfur (rotten eggs) and placed a couple of drops between Joe and the driver. Slowly, the driver turned to Joe with a ‘I can’t believe you did that’ expression. No words spoken. Then in the hotel, on the elevator (a crowded elevator) Moe did the same thing. Now, instead of just the driver, you had some 6 or 7 people with that ‘I can’t believe someone did that’ expression. I was trying to make myself invisible. As it turns out, Moe was really a good guy, and very sharp in the stock market. Over the years he has made lots of money for his baseball friends. 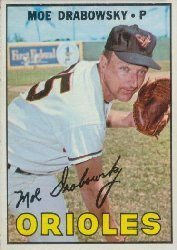 He was also a very good big league pitcher who had a memorable year in 1966 with the Orioles and in the World Series against the Dodgers. I was very sad when he passed away recently. Coming Wednesday: Writing to former Kansas City A’s…my 10 Most Wanted List.